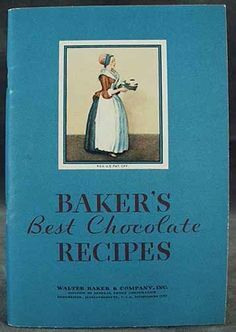 Cookbook #118: Baker’s Best Chocolate Recipes, General Foods Corporation, 1932. This small cook book had me totally fooled. Piled in a messy stack of booklets, I thought it was just another manufacturer’s cookbook from the sixties or seventies. The cover is missing. The recipes read “modern”, not dated. I find my mother’s notes on a few of the cake recipes, so it wasn’t mine. 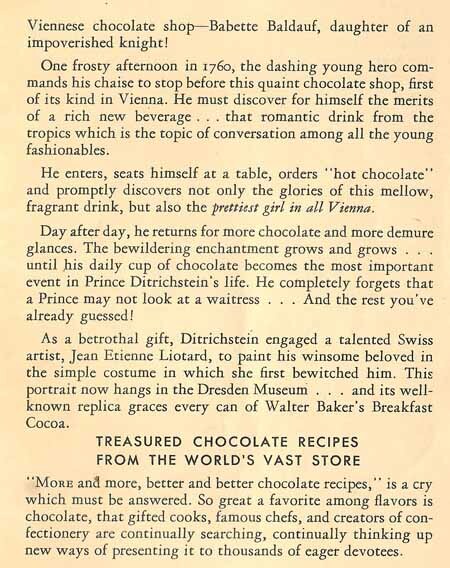 Finally I think to ask: “when was this published?” OMG, it’s from 1932! It should have been shelved with the vintage cookbooks. I have found another treasure, albeit a little one. According to this book, the first chocolate mill in the US was built on the banks of the Neponset river in Dorchester, Massachusetts. 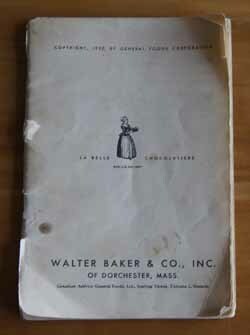 In 1780 it became the establishment of Walter Baker and Company. 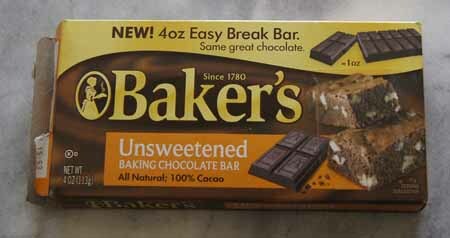 We can still buy Baker’s chocolate today, although it is currently owned by Kraft Foods. I will definitely keep this cookbook. 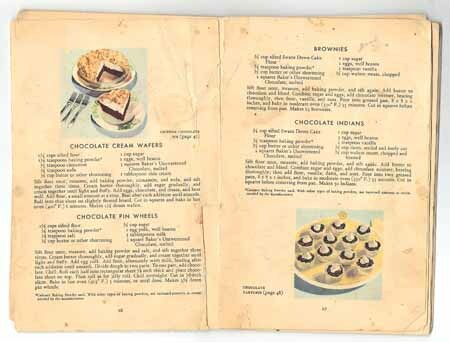 Not only because it is old, but because it has good basic chocolate recipes, like for a cocoa syrup if I run out of the bottled kind, and cakes and chiffon pie and eclairs and on and on. I decide to make the brownies for this blog. 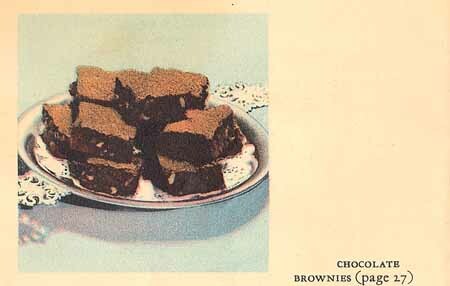 Sure, I have dozens of recipes for brownies, but this one is from 1932! 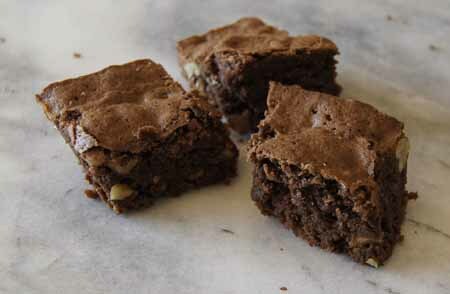 I think one of my older cookbooks has the original brownie recipe, but that will be the subject of a later blog post. Stir together the flour and baking powder. Melt the butter and chocolate in a saucepan and let cool a bit. Beat the eggs, then add the sugar and beat it in. Add the chocolate mixture, beating thoroughly, then add the flour mixture, the vanilla, and the nuts. Bake in a greased 8-inch square pan for 30-35 minutes, until they test done with a toothpick. This entry was posted in 250 Cookbooks, Cookies by admin. Bookmark the permalink.